Last weekend I gave a 2.5 hour presentation of my 18th century French binding workshop for the Guild of Book Workers (GBW) Standards of Excellence conference in Tucson, Arizona. And I agreed to do it four times, over a two day period. It was quite difficult to condense essentially a week long class into a 2.5 hour presentation, and tiring to repeat it four times. Fortunately, a number of guild members offered provocative and challenging questions/ opinions which helped me to stay engaged. The GBW Standards, which started in 1982, have had this format in an attempt to keep the presentations intimate. However, according to Don Etherington, in his autobiography, Bookbinding and Conservation: A Sixty-Year Odyssey of Art and Craft —which is an important history not only of Etherington, but of book conservation generally in America–originally the attendance was capped at 100 attendees and presenters repeated presentations only three times. It is perhaps the single instance in which the old timers had it a bit easier than we do. Hopefully, due to cost effective video, future seminars might be able to reduce the strain and repetition for the presenters, while maintaining the essential nature of the Standards experience, and perhaps even improving the transmission of information? The GBW seems to be moving forward with new technologies- they have even started a blog, currently with an overview of Martha Little’s presentation. At some point in the future, an edited video will be available for purchase from the GBW of all four presentations. In this presentation, I will discuss and demonstrate a number of aspects of late 18th century French bookbinding structures, mainly focusing on the ubiquitous stained, full calf binding style. This time period is important because it represents the end of in-boards full leather as a vernacular binding style; soon afterward, cloth case binding begins to predominate. This transitional time is also unique because it is the first time that the techniques, workshops, materials and tools of bookbinders were extremely well documented by multiple contemporaneous sources: Diderot, Dudin and Gauffencourt. Because of this documentation, it is possible to reconstruct rare or nonexistent tools, learn about fabrication techniques not visible when examining the books themselves, and understand more about the materials that constitute these bindings. By studying these aspects, we can appreciate how these somewhat minor points begin to relate to larger questions concerning the history of material culture, conservation and preservation issues, the history of craft, the transmission of textual information, and, of course, the history of bookbinding. These books have been beaten by hand, according to Dudin, eight(!) times: the sheets are beaten before folding, then after folding, the boards are beat on the inside, the cords are beat after lacing, the spine is backed, the turn ins are beaten before covering, the outside of the boards and joint is beaten after covering and the corners are beaten on the inside before delivering the book. Endleaves are commonly a white folio wrapped around a marbled or plain one. Sewing is often on 5-7 raised cords. Boards are cut less than 90 degrees at the joint. Typically large backcornering. The book is backed after the boards are laced on. Lacing is almost always through 3 holes, then cross-mounted, at least at the head and tail. Edges are most often colored or sprinkled, usually red. Spines have parchment, goldbeaters skin, or paper transverse linings extending onto boards. First class work uses a comb type liner. Endbands have a rolled paper core, often blue and white. The leather is usually decorated (sprinkled, stained or marbled) by the binder. Cheaper work was made with pre-decorated leather purchased by the binder. Endband cores are usually stiff, detached, cracked, broken or lost. Often only two or three tiedowns. Leather surface is often brittle, fragile and deteriorated. Grain surface often peels off like sheep. Multiple applications of Aqua Fortis (aka. Nitric Acid), mixed with wax and oil can cause complex interactions. Sometimes the leather detaches from the boards. Makes tissue repairs on the surface inadvisable without lifting. Covering leather is often stiff and does not move very much. Opening the book can crack the joint. Spine often immobile- book will not stay open without excessive force for consultation or exhibition. Often very heavy applications of glue and paste on the spine. Rapid and crude backing sometimes forces endsheets onto the outer face of the boards, causing the board to hinge from this point. Using a grattoir damages the signatures. Caps usually badly damaged or missing. 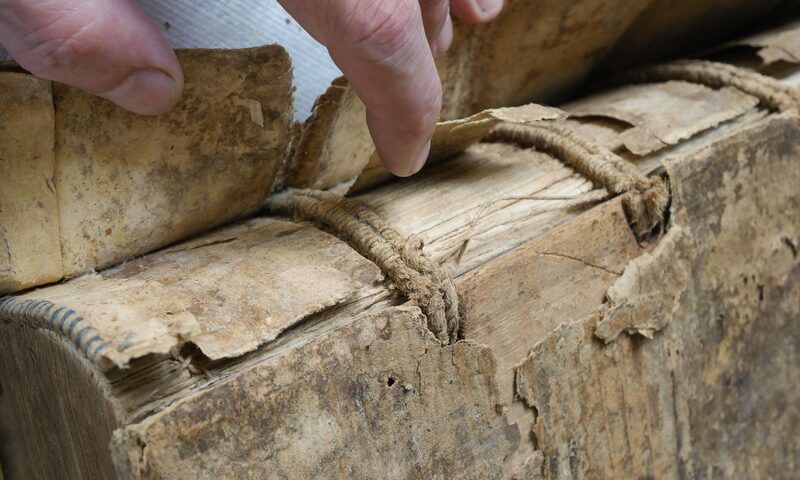 Leather on the spine is often very thin, fragile and difficult to lift. Title or volume labels are often missing, fragmentary or detaching. Parchment transverse spine linings sometimes pull away, along with pastedown, from inner face of the board. Sewing cords are often weak and brittle. Tooling is often so lightly and quickly impressed, that gold flakes off. Pulp boards are extremely difficult to split, and can loose chunks unpredictably. Due to the beating, they rarely are planar, easily distort and change dramatically in thickness. Cundall, Joseph. On Bookbindings: Ancient and Modern. London: George Bell and Sons, 1881. Darnton, Robert. The Great Cat Massacre and other Episodes in French Cultural History. Basic Books: New York, 1984. Dudin, M. The Art of the Bookbinder and Gilder. The Elmente Press: Leeds, England. 1977. Eagan, Jane. ‘Board Making in Lalande’s Art du cartonnier‘ in Looking at Paper: Evidence & Interpretation, Canadian Conservation Institute, Toronto, 1999. Encyclopedie Methodique. Encyclopedie Methodique, ou par ordre de matieres, par une Societe de Gens de letters, de Savans, et d’Artistes. Paris, Panckoucke et Agasse, 1790. Foot, Mirjam M. Bookbinders at Work: Their Roles and Methods. The British Library and Oak Knoll Press, London and New Castle, DE, 2006. Gauffecourt, Jean-Vincent Capronnier de. Traite de la Relieure des Livres: A Bilingual Treatise on Bookbinding. W. Thomas Taylor, Austin, 1987. Hobsbawm, Eric. The Age of Revolution, 1789-1848. Vintage Books, New York, 1996. Pollard, Graham and Esther Potter. Early Bookbinding Manuals: An Annotated list of Technical Accounts of Bookbinding to 1840. Oxford: Oxford Bibliographical Society, 1984. Salaman, R.A.. Dictionary of leather-working tools c. 1700-1950. London: George Allen & Utwin, 1986. Smith, Godfrey. The Laboratory of School of Arts. In The History of Bookbinding Technique and Design. Garland Publishing, Inc. New York and London, 1990. Uzanne, Octave. The French Bookbinders of the Eighteenth Century. Chicago: Caxton Club, 1904. Wolf, Richard. Marbled Paper: Its History, Techniques and Patterns. Philadelphia: University of Pennsylvania Press, 1990. BOARDS – So far the closest board I’ve come up with is laminating with PVA (yes, I know… but paste tends to delaminate when beating) 4 ply matboard with a sheet of blotter on each side. It gives a lightweight feel, but compresses to half the original thickness when beating. EDGE COLORING – I use AYTEX-P, they used flour paste. Two heaping tablespoons per 200 ml. Water, heat in double boiler until thick and turns translucent. Mix with vermillion, a little water and a few drops of vinegar and a little alum. According to Gauffencourt, “…until all is well mixed & neither too thick nor too thin.” Given the large number of variables when preparing and applying the coloring, this is surprisingly accurate advice! SPRINKLING – Quick method–2 parts Fe(II), 2 parts Tannin, 30 parts cheap red (lots of tannins) wine. Heat about 15 min, then seems to be ready in an hour or so. GLAIRING – Just egg white, a little clean water if it is too sticky. I = I WOULDN’T ROUND THE BEVEL, IF I WERE YOU. It will create an obtuse bevel that will not cut. T = THIRTEEN DEGREES. This seems to be the close to ideal for paring vegetable tanned and tawed binding leathers. S = SCRATCHES IN THE METAL. Examine the scratch pattern by slightly changing the angle you are holding the knife when sharpening. Make sure the new scratches extend to the cutting edge. Thank you VERY much for sharing your detailed workshop notes. Much appreciated as one who could not be there. Your coverage of this subject is very thorough, I learnt a considerable amount. Hey Jeff, it’s really great that you agreed to do a presentation for Guild. Glad you got good questions. The 4 times in a row thing is tough. I was lucky the year I presented, since we had a stadium with really sophisticated projection and a huge screen behind me. Everyone was able to sit all together for each presentation, done one time only. We shall see what the future brings!